Here’s the latest available Sundroid Rush plan gadget, Alcatel One touch Glory 2 and Alcatel T7 HD tablet all in one at Sun Plan 600. This is another perfect double deal that you can avail from the network plus the call and text services bundled. In case you missed their Sundroid Samsung and Starmobile edition , you can subscribe to this as it bundles 2 gadget in 1 postpaid plan. If you can recall Sun already offered Alcatel gadgets on their previous Sundroid Rush promotion, this time the free devices gets bigger in terms of specifications and package. Their previous offer bundles Evo 7 tablet and a Broadband SIM at the same plan price. 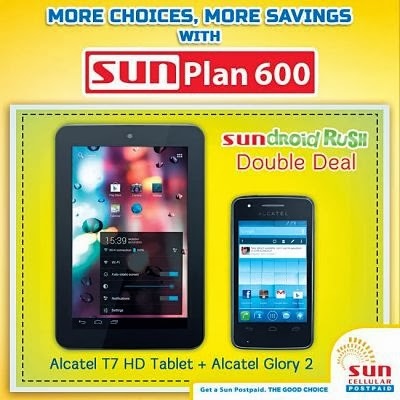 When you apply to Sundroid Plan 600, you can now own a Alcatel HD T7 tablet and the Glory 2 Android smartphone for free. For more details you can call Sun hotline or visit your nearest Sun Shop. For postpaid application requirements you can check out How to Apply Sun Plan.